A half step is the term for the distance of any two notes that are next to one another. For example: F to F#, or A to Ab, or C to B. A whole step is the term for the distance of any two notes that have exactly one note between them. For example: F to G, or Bb to Ab, or B to C#. The two half steps in a C major scale occur between E and F and B and C. The black notes are the notes that are in between each whole step. Therefore, on a piano, a C major scale is all white notes. 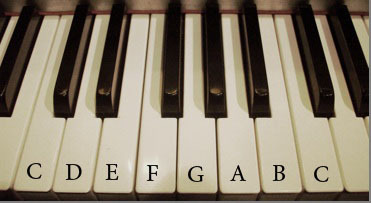 *Note that regardless of the instrument, in music there is never a note in between E and F or B and C.
Yes there are 12 different notes/keys and each one has it's own major scale. It's very important to be familiar with all 12 major keys. It's a tough project to learn them all and it does help to have the guidance of a teacher or a knowledgeable musician. That one is a little trickier. Well go ahead and learn those major scales! Pre-sign up for Major Scales e-course!